A delicious tapa, snack, hors d'ouevres - and cheap too! Straight out of the can, onto a plate, with a squeeze of lemon, some crusty bread, and a glass of sherry. 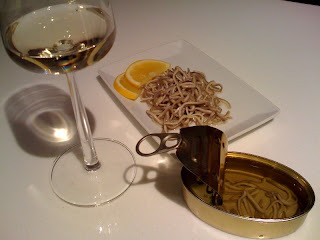 The surimi "eels" are like lovely, delicately fishey strands of buck wheat noodles. They are prepared with chili and garlic so there is a lovely bit of heat that hits the back of your throat. Real baby eels are a Basque specialty and are fished from rivers at night by a small number of companies in northern Spain. The baby eels must be kept alive after capture for about a week until the backs turn dark. They have become so rare that real baby eels cost more than a hundred dollars for 4 ounces. These are a cheap and easy snack that won't really scare your guests since they don't actually have eyes (http://tinyurl.com/akcdvc). A wonderful combination, paired with a glass of Spanish white wine - or in my case - a glass of Pedro Romero Manzanilla Aurora sherry. The sherry is light, dry, crisp, nutty, briny, fresh - and inexpensive as well ($10.99 for 500ml).